The Beer & Wine Garden will be open before and during this show! Come early to enjoy a local craft beer or glass of wine. Sam Weber is a singer-songwriter and multi-instrumentalist in the vein of Jackson Browne, The Band, The Wood Brothers and Gillian Welch. He has been touring independently and internationally with his band since 2013. Years spent refining songs at home in North Saanich, BC and working in studios in Los Angeles have honed Weber’s craft to a fine point. His live show pairs heartfelt songwriting with world-class musicianship and 3-part harmony. He has released two LPs to date - Shadows in the Road (2014) and Valentina Nevada (2016) - and a new EP this past summer titled New Agile Freedom, with which he and his band on tour now. Through the characters and anecdotes in his songs, Weber sings about the truths of love, life and family. Sam was born into a musical family. He started piano lessons when he was 6 years old but made a swift transition to the electric guitar the first time he heard the Aerosmith song “Dream On”. In the summer of 2011, Sam attended a summer program at the Berklee College of Music on scholarship. He was one of ten other young songwriters chosen to perform in front of his class at the Berklee Performance Center. 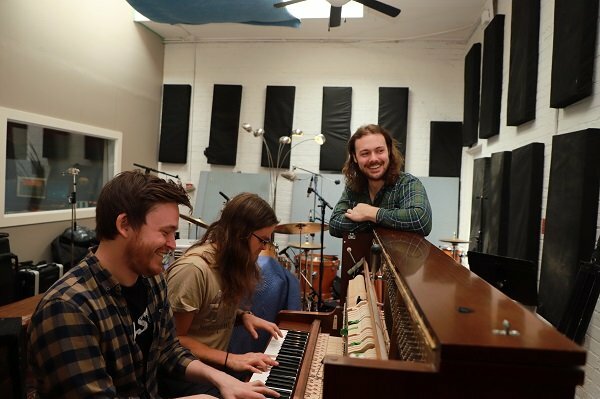 During that time he shared private songwriting classes with pop-star Maggie Rogers; the two have remained friends ever since. By the end of his senior year in high school Sam was working in studios recording other bands and completing his first LP, Shadows in the Road. The album was picked up by Canadian label Cordova Bay Records who signed him to a modest two-album deal. His music caught the ear of music journalist Anil Prasad, who interviewed Sam for a three page feature in Guitar Player Magazine. Sam remains one of the youngest people ever to be featured by the publication. Weber and his band played 50+ shows over the summer and fall of 2018, included a KEXP affiliated concert series in Seattle, WA, shows in Norway and Sweden, and numerous concerts and festivals across North America.